The New Year is still moving so fast and if one of your resolutions was to lead a healthier life, by now you should become used to taking nutritious foods. The only way of making sure you are leading a healthier life is eating snacks that are nutritious. But how do you know that the snack you are eating is nutritious? We all know the popular condiment salsa and at a certain point in your life, you must have come across salsa. Whether you are attending a friend’s party or going out with a friend, rarely can you fail to notice the presence of salsa as part of your meal. The question is, is salsa healthy? That is a good question. Let’s explore. Fresh salsa can be used to add flavor to your food. This great sauce can vary greatly in terms of the taste and ingredients. You can also create a good combination of the sauce with chips. For those who are still asking if chips and salsa is a healthy snack, you already got the answer. So if you have been taking salsa, you can increase the serving to make sure you are getting the best out of the meals. If you are still looking for more reasons for taking salsa to keep healthy, here is a list of the top benefits associated with salsa. Potassium is an important mineral in your body. It plays a great role in regulating the body fluid and control of the nerve impulses. It is the third most abundant mineral within your body. Despite the fact that potassium plays an important role within your body, most people are not so sure how they can get enough potassium in the body. The processed foods do not contain enough potassium meaning that you need to find alternative sources of potassium. Salsa is a healthy condiment and taking salsa and chips once in while is a great way of boosting the potassium levels in your blood. Citric acid found in lime is healthy in a number of ways. As there is an increase on the importance of leading a healthier lifestyle, doctors are recommending lime as a great way of avoiding illnesses. It is incorporated in most of the medicines and herbs. The incorporation of lime in salsa condiment makes it a healthy snack. Quercetin is a great anti-oxidant found in salsa and chips snacks. It is used by the body in the prevention of many health issues including obesity, inflammatory diseases, hypertension, and metabolic syndrome. The substance is available in a wide variety of fruits and vegetables and salsa snack is one of the healthier snacks that contain quercetin. If you have been looking for a great way of reducing the risk of cancer and reducing the occurrence of neurological diseases, salsa snack is healthy for you. You can include the serving of this great meal in your regular diet. Another great reason that makes salsa healthy in your life is that it contains lower than 10 calories in each of the two tablespoons of the serving of salsa. So there is no need to limit your intake of salsa and chips. You have all the freedom you need to top up with your favorite foods with the salsa. Apart from taking salsa and chips, there are other great alternative meals. The best way of making sure your skin is looking youthful and healthy is by taking enough vitamins. Salsa is a healthy meal used to increase the look on your skin. The lime, tomato, and onions used in the making of the salsa snack are all great sources of Vitamin C.
Vitamin C makes salsa healthy since it prevents aging and heart disease. Vitamin C is not found in most of the cooked foods meaning that the best way of making sure you are consuming the vitamins is by taking it when it is raw. Salsa and chips are healthy for you since it is taken when it is raw meaning that you will get enough Vitamin C.
Fiber is a great component in your body. It can be found in the cell wall of most of the plants. Salsa is one of those healthy substances which is full of fiber that does not contain any fat or sugar. Salsa is a healthy alternative for people suffering from Type 2 Diabetes and they are looking for ways of adding flavor to their food without increasing sugar. Therefore, grabbing a snack of salsa and chips once in a while can be a great way of getting all the flavor you are looking for in your food. There are numerous studies which have been carried out to find the ways in which fruits and vegetables prevent cancer. The findings show that tomatoes have strong cancer-prevention attributes when compared to the other fruits. This is because they do contain carotenoid lycopene that is of great use in fighting cancer. Salsa contains tomatoes making it a healthier alternative if you are looking for the best way of preventing cancer. 95% of the total weight of the tomato used in making salsa condiment comes from water. We all know the importance of water in our bodies and it is always recommended that we take eight glasses of water each day. Taking foods rich in water is also important as it can help you to have the needed amounts of water in your body. Taking foods such as salsa is the best way of making sure you are leading a healthier life. Jalapeno is a great spice used in the making of the fresh salsa. The spice is obtained from capsaicin. Capsaicin plays a great role in increasing the burning ability of the fats found within your body. Using salsa should be the best alternative for one who is looking for ways of losing their weight while leading a healthier lifestyle. No matter the type of meals you are taking, chips and salsa should form part of your regular diet. Chips and salsa are indeed healthy for you and you can use it to at least compliment your dinner. You only need to take a little and leave space for your dinner. Remember it is only an appetizer and taking too much of it would not be a good idea. If you want to buy the tortilla chips to take with your salsa, the first thing you need to ensure is that whole grain is listed on the packaging as the first ingredient. It can be barley, white rice or even corn. Just make sure there is whole grain. Whole grains are not yet refined and they contain so many nutrients since none of the vitamins, fats or minerals have been removed from it. Most of the white grains have already been processed meaning that they do not contain most of the nutrients and vitamins. It is also good to make sure that you choose tortilla chips which are low in sodium since choosing ones that contain too much sodium can lead to high blood pressure. What Can You Eat with Salsa Apart from Chips? 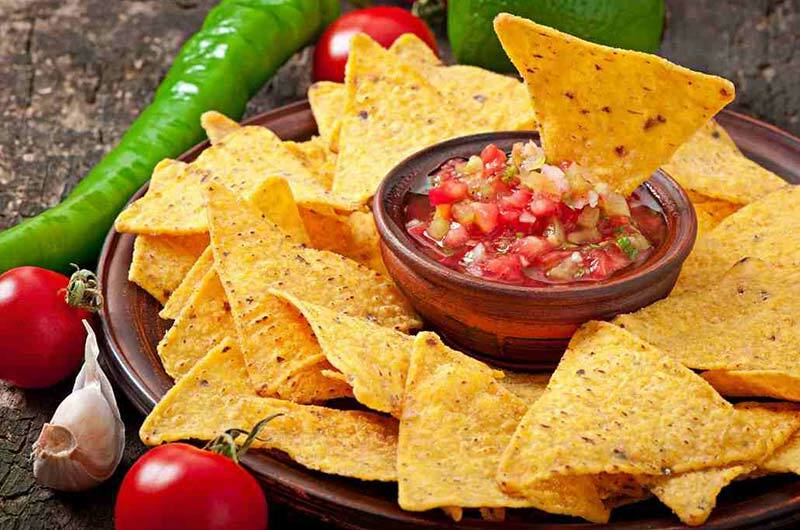 We are all used to taking chips and salsa in the parties we go and every time you think of taking salsa, the next thing which will come to you is chips. Of course, chips and salsa is healthy for you but finding alternatives to chips is healthier. The usual way of eating salsa that is by dipping the chips in the salsa can make you take so much fat and salt which is not necessary for your body. So how do you make chips and salsa to remain a healthier snack for you? The best option is to do away with the fried chips and use the baked chips instead. Here are some of the creative alternatives for making salsa to remain a healthier snack. This can work best for you if you are using the fruit-based salsa and salmon. The only thing you need to do is to wrap the salsa and the fish with a foil. This is to ensure there is an easy turning of the meal on the grill. Making grilled fish is so easy and with the right ingredients, you can make the best meal you have ever thought of. Taking the salsa with the grilled fish instead of the chips is a great idea. And it is a great way of breaking away from the norm. Using the Mexican cheese with your salsa is also a healthier alternative. But remember, cheese contains fats. So, it is important to watch out on the amount of salsa you are adding to your snack. Most of the salads bought in stores can be high in sugar, fat, and salt. On the other hand, green salads are low in calories. If you still want to take the store bought salads and you do not have a way of cutting out the high calories in it, having a scoop of salsa on the salad should be the best alternative. Salsa can work well with the salads which are containing beans. So the next time you get your salads, just add a scoop of salsa to make them healthy. Salsa is indeed a great condiment for meals and it can be used to socialize with people. Remember those times when you get into a party. The person seated next to you breaks their bag open to get their salsa and tortilla chips out. The next thing you do is to move closer to them. Then stir up a conversation so that you can taste the salsas. Before long, you realize that everyone has joined up in the conversation and you are all having fun or dancing as the music is playing. Is that not really interesting? Fruits and vegetables play a great role in the prevention of most of the chronic diseases. There are many ingredients in salsas which contain all the necessary nutrients your body needs. Is Chips and Salsa Healthy Snack? If you’re still asking such a question, then you are not ready to lead a healthier lifestyle. Go out to the grocery shop and get all the ingredients to make your own fresh salsa. You can as well get the already made salsa from the nearest store. You will have gone a step ahead in reaching your health resolutions this year.